Beat butter and ½ c. of the confectioners’ sugar and extract in a medium bowl with a wooden spoon until light and fluffy. Stir in nuts. Stir in flour until a soft dough forms. Gather the dough into a ball; wrap in foil or cellophane and refrigerate several hours until firm. Divide the dough into quarters. Work with one quarter at a time, keeping the rest refrigerated. Four hands lightly; shape a quarter of the dough on a lightly floured surface into a roll about 1″ in diameter. Cut roll into 1/2″ lengths. Turn each cut side up and press a cherry into the center. 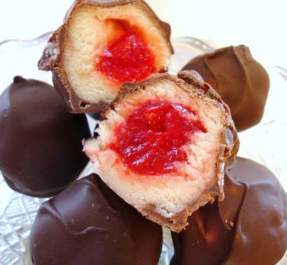 Shape the dough into a ball to completely enclose the cherry. Place on an ungreased cookie sheet 1/2″ apart. Bake at 350° F. for 20 min. until lightly browned. Cool on racks. Blend the remaining 1½ c. 10x sugar with milk or water in a small bowl. Dip tops of cookies into the glaze, then put back on the racks until the glaze has set. Put a sheet of wax paper under the rack to catch the glaze that drips off (rescue). To decorate, tint a small amount of frosting green, Pipe on leaves, dot the centers with red decorating gel.